Dear deputies and invited representatives of the media! I present to you the report on our work for 2016. The reporting year, as well as all previous ones, was difficult for us. While there has been stabilization, we were forced to live and work in a heavy mode of saving, mobilizing all of our internal resources. But we always set ourselves ambitious goals and high standards, which is enabling Kazan to lead in almost all directions. Last year, we together, dear deputies, have approved the most important document, on which serious experts were working: the Kazan Strategy until 2030. The most difficult challenge in it is to make Kazan the most comfortable city in Russia. It is made up of many components: it's the economy, public transport, landscaping ecology, safety and education - all areas of the city economy and urban life. Significant growth in the number of branches allowed stopping the decline in production due to the difficult economic situation in 2015. The industrial production index reached 100.3%. The gross territorial product, according to preliminary estimates, amounted to 632.8 billion rubles. Sales of goods - 328.6 billion rubles. The estimated volume of investment in the economy – 174.3 billion rubles. Positive dynamics is caused by the building-up of capacities of our flagships, as well as an increase in the production volume of the military-industrial complex enterprises. The best indicator of the urban economy state, which is noticeable to the naked eye, is the work of the construction industry. The volume of work, performed in the construction, amounted to nearly 120 billion rubles. Our city is at the forefront among megapolises by these indicators over the last 10 years. More than 72 thousand people are employed in the industry. The new General Plan and new rules for land use and development are currently being developed in collaboration with the Research Institute “General Plan of Moscow” in connection with the accelerated development of the city and the growth of the population. The forecast, according to which the population in 2035 will be 1.5 million people, was received as an indicator for the development of a new General Plan. The transport network of Kazan is one of the most modern and comfortable in Russia, according to many Russian experts and our colleagues from other cities. In total, more than 252 million passengers were transported by urban passenger transport in 2016. 100% of metro, buses, and trolleybuses and 68% of trams provide comfort to people with disabilities. 611 buses, 62 trams and 128 trolleybuses were purchased since 2013, 108 buses, 22 trams and 70 trolleybuses of them - in 2016. By decision of the President of the Republic, the work on the improvement of recreational areas will be continued. 401 million rubles have been allocated for these purposes from the republican budget. In addition, our socially responsible enterprises have invested 256 million rubles, and thanks to their managers and labor collectives from all Kazan residents! The new Gorkinsko-Ometevsky forest, which has already become a favorite vacation spot for residents and neighborhoods of the Azino and Gorki, was updated in Kazan for the first time in 40 years. We will get an enormously positive effect as a result of improvement of embankments and water objects. This year we start landscaping of the embankment of the lakeside Nizhny Kaban and reviving of the Lebyazhye Lake system. Housing and communal services are an industry that affects the interests of all citizens. <...> During the first 9 years of the overhaul program, 2191 houses were renovated (more than 40% of the housing stock of the city), more than 30% of all elevators were replaced (1911). For comparison, 1526 houses were repaired during the same period in Samara, in Ufa – 1424, in Perm - 1051. During the year, 165 houses repaired totaling 1.45 billion rubles. Demographics continue to please us. In 2016, 24564 newborns were registered in Kazan, which is 2.1% more than last year. Demographic records pose new challenges: born babies need kindergartens and schools. 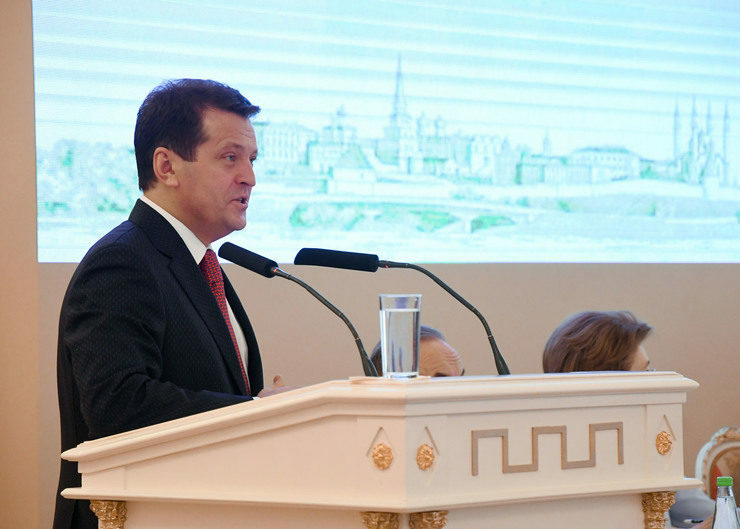 324 kindergartens, 167 schools, and 106 further education institutions operate in Kazan. The coverage of children by preschool education is 75%, which is higher than the republican number. 76 kindergartens for more than 13 thousand people (13096) were put into operation during the period of federal and regional programs implementation, including 6 ones - for the year. Our schools continue to lead at both the republican and the federal level. The results of the final certification at all levels are above the republican and Russian indicators. The amount of excellent work has increased by almost 20% compared to last year. 50 graduates received 100 points, which is 37% of the total number of the best works in Tatarstan. The number of medals has increased by 14% (538 vs. 463 in 2015). Kazan in recent years has become a leading center for advanced medical technologies. Our goal was and is to improve population health, decrease morbidity, mortality, and increasing of life duration. During the reporting period, there has been a tendency to reduce mortality from cardiovascular disease by 0.4%, and mortality from myocardial infarction decreased by 6.0%. In 2016, we achieved the lowest infant mortality rate in the last 10 years. It was 3.8 per 1,000 newborns. 2016 was the year of the fight against cancer. The share of advanced forms and the mortality from malignant diseases have decreased. The issue of strengthening the material-technical base of hospitals and clinics still remains valid. More than 2.2 billion rubles has been allocated for major repairs and construction of health facilities in the reporting year. In addition to the development of modern medicine, we traditionally pay much attention to healthy lifestyles, creating conditions for the development of mass sports and engaging citizens in systematic physical training. As a result, the number of Kazan citizens, who regularly engaged in physical culture and sport, was 450,230 people, i.e. 40.1% of Kazan residents, aged from 3 to 79 years old. Undoubtedly, the main sporting event of the year is the Confederations Cup, which will be held in Kazan from 18 to 24 June. On November 26, 2016, the draw of the FIFA Confederations Cup was held in Kazan, the results of which determine that Kazan in 2017 will take matches: Portugal - Mexico, Germany - Chile, Mexico - Russia. We grow with the number of tourists every year. 2.5 million tourists visited Kazan for 2016, which is 16% more than in 2015. A larger number of tourists arrived from China, Germany, Turkey, France, Italy, and the United States in 2016. According to leading international ratings, Kazan was among the three most attractive Russian cities for tourism throughout the year, as well as the most sought among cities in the country for recreation in May holidays and the New Year’s holidays. We briefly discussed the main achievements and our plans for the future. Of course, the life itself, political and economic situation in the world and the country will adjust our plans in one direction or another. But we do not have the moral right to lower the bar, which we raised by approving the development strategy. Our citizens are active, educated, motivated, and must live in the most comfortable city in the country. To live, to work, to enjoy the urban space, culture, and sport, to bear and raise children, putting them in the ideals of goodness, justice, and a healthy lifestyle. Over the past few years, Kazan has managed to become a leader in many areas, often occupying the first lines in a wide variety of ratings. But the Kazan’s high quality of life, to which we aspire, is characterized not only by the socio-economic indicators. In conclusion, I want to go back to the purpose, for which we have started the conversation. It is our desire to be the most comfortable city in Russia. Just roads, boulevards and parks will not create a real comfort. One is really comfortable when one feels that he is important and necessary, that his opinion is important, he manages the changes in his own fate, the fate of his house, the street, the city. We talked a lot about the achievements of the city today. But it seems to me that the most important result of the past few years is the civil society, which is responsible for the fate of the city, for its future, and which is developing in Kazan. Our population is not indifferent to what is around them, they are ready to participate, offering their ideas and start their own projects. Active people are the best prevention of errors and the most important condition for the development of any city.